Baby elephant comes to Gonzales, Texas. The Dailey Brothers Circus has been getting a lot of attention lately. It was featured in a Times Past column and more recently Inquirer editor Charles Wood wrote a very interesting feature story about the old circus. For those who don�t remember, the Dailey Brothers Circus had their winter quarters in Gonzales, Texas, during the late 1940s and was a very important contributor to the local economy. 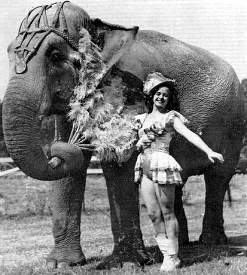 When I featured the old circus in Times Past, the story was about the great elephant stampede and the somewhat humorous things that happened during that event. One of the things that struck me funny was how the owner of the circus, Ben Davenport, found one of the baby elephants near the Guadalupe River after the stampede. The story goes that Davenport transported the elephant, �Little Butch,� back to Gonzales in his Cadillac convertible. I wonder how the other motorists reacted to that sight? While doing the research for the circus story, I came across the following article that contains some interesting information about how the elephants first came to Gonzales from India. It is from the January 15, 1948, issue of The Gonzales Inquirer. A small herd of rice-eating, rum-drinking elephants from India rolled south by rail Friday toward their home deep in the heart of Texas. The nine elephants, along with three zebras, four pythons and 200 monkeys, were put ashore at Boston harbor Thursday after surviving a rough ocean voyage. They were shipped from India for the Dailey Brothers Circus at Gonzales, Texas. Star attraction of the lot was �Butch,� probably the smallest elephant ever seen in the United States. He stands three feet high and weighs less than 250 pounds. Two other elephants died in route � probably from heart trouble induced by the high seas. Louis Reed of Chatham, N.Y., who purchased and escorted the animals on their one and a half month trip, said the elephants probably died of excitement after their hearts became weakened in fighting against captivity. �Butch,� however, was too little to be bothered, Reed said. But the little one did require constant care and regular doses of rum in addition to his diet of rice, warm milk, oatmeal and syrup. In all �Butch� and the other eight survivors drank about 15 gallons of rum. The biggest �shot� was given to a larger elephant, �Virginia,� who became shaky and collapsed just as the S.S. Irisbank entered Boston Harbor. �She needed a full gallon to get back on her feet,� Reed said. Despite the roughness of the sea and delays caused by engine breakdowns, all the animals weathered the trip in good shape. Two representatives of the Massachusetts Society for the Prevention of Cruelty to Animals inspected the cargo and decided it was in top-notch condition. They concentrated their examination on �Butch,� believing that if the little dumbo-like animal � could not even use his trunk properly � lived through the trip, the treatment must have been of the best. Besides the rice and rum, Reed had to purchase more than six tons of hay to feed the elephants, ages of which range up to two and a half years. They cost approximately $1,500 each. �They required care. And good care because they represent a sizeable investment,� he said. The animals were shipped to circus headquarters by rail after going through a quarantine examination.